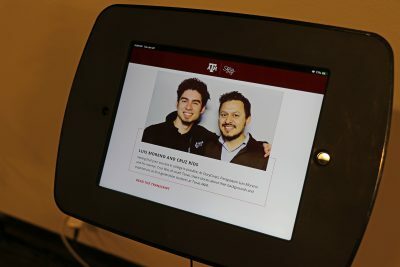 Two DMS leaders were featured in the “StoryCorps at Texas A&M” opening reception on Tuesday, January 22. DMS Assistant Director Cruz Ríos and junior Luis Moreno gave listeners direct insight into their friendship and discussed topics on Latino identity and academic success. The event, held at J. Wayne Stark Galleries Education Gallery, features over two dozen additional interviews from current and former students, faculty and staff reflecting on their unique Aggie experiences. Moreno, a Paraguayan native, met Ríos during his freshman year at Texas A&M. Shortly afterward, Moreno learned about Latino Males United (LMU) — a program that Ríos advises. “Participating in Texas A&M’s StoryCorps was an opportunity for me to showcase the strong mentoring relationship I have been able to establish with students but also feature the great work the DMS has been able to do with our students of color,” Ríos said. The exhibit will run from January 22-31 in the Stark Galleries located inside the Memorial Student Center. Ríos and Moreno’s interview can be found on the Texas A&M – StoryCorps page.